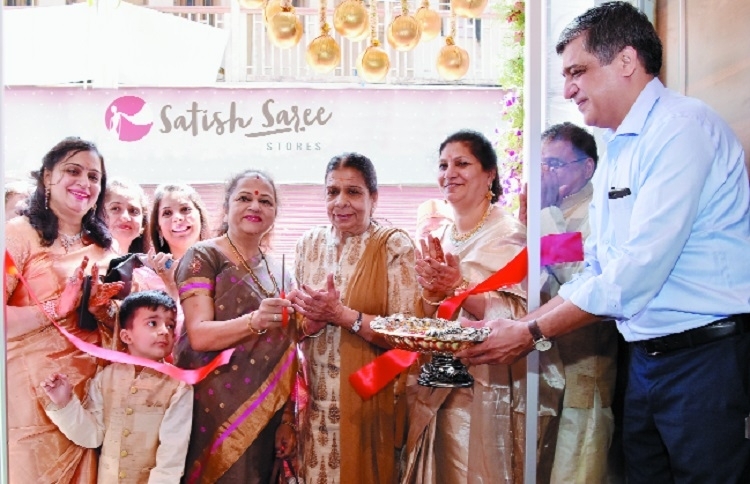 Union Minister Nitin Gadkari’s wife Kanchan Gadkari on Saturday performed inauguration of new howroom of Satish Saree Stores at Modi No 3, Sitabuldi in the city. On the occasion, Kanchan Gadkari praised the collection put on display in the showroom. She also said that the Satish Saree is known for its exclusive range of sarees. Later on she gave best wishes to Shankar Khemchandani, Director of the showroom and others. The showroom is one of its kind in entire Vidarbha. For the wedding season, Satish Saree Stores offers new, exclusive and traditional saree collection. The new renovated showroom consists of three floor. Each floor is having selected section for silk sarees. Shankar Khemchandani, Director of Satish Saree Stores said, “To make one’s wedding memorable the groom and bride take efforts in every way. Taking these feelings into consideration, Satish Saree Stores is showcasing traditional pure silk sarees, handloom, chiffon, georgette, synthetic sarees, Banarsi sarees, pure Paithani, Kanchipuram, Gadwal, Ikat, Uppada sarees in exclusive designer concept. The stock is as per the requirements and needs of the customers.” Satish Saree Stores is known for its quality as one of the prime features. It has in-house production and designing house. Everything, it creates is one of its kind and unique. It constantly keeps up with new fashion trends in the market. Raw material is provided to master weavers. About 90 per cent of the work is done in-house. Procurement takes place from more than 60 different places across the country. He said as per the changing times the store constantly brings in latest wedding patterns, modern creations, selected fabrics, modern gowns, designer suit, kurti, Indo-western and unique and creative fabrics for the customers. The business was started 55 years ago by Nihalchaldas Khemchandani in a 180 square feet shop. Today it has grown to 8,000 square feet.